The vibrant turquoise green color of this vintage slip instantly transports you to a luxury island paradise. Uniquely styled for a smooth, flattering fit. Crapelon nylon tricot has a muted luster and a subtle crepe-like texture; itis soft, lightweight, subtle and wonderfully comfortable. Stunning lace trim. Authentic vintage condition: Freshly cleaned and arrives ready to wear. About Hollywood Vassarette: Originally known as the Vassar-Swiss Underwear Company of Chicago; renowned for it's production of both ladies and men's undergarments. In 1951 the Vassarette label was introduced to distinguish the women's lingerie division of the parent company, Munsingwear. 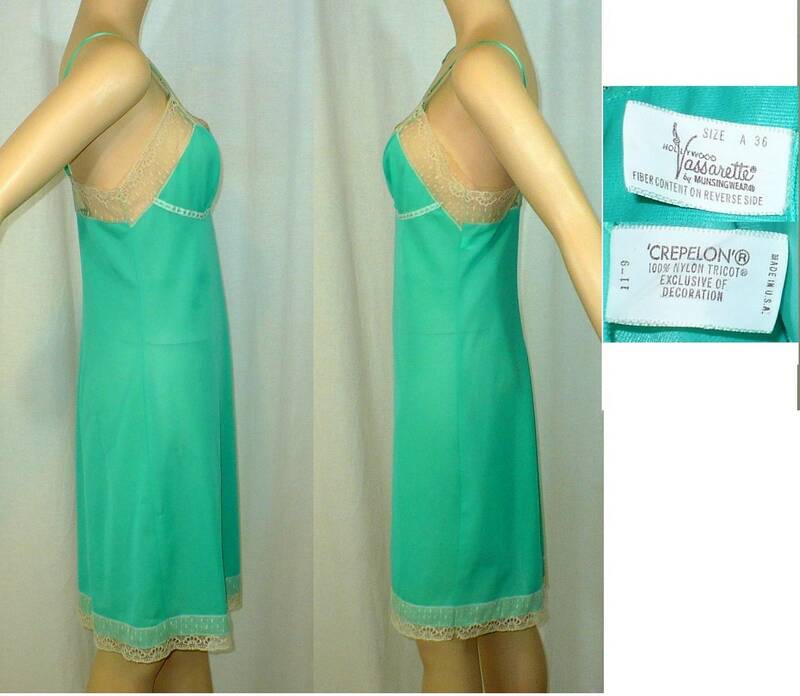 In the earaly 1960's, Vassarette introduced colorful and playful lingerie in response to the confidence of the women's movement and labeled it "Hollywood Vassarette" - represented by the slip we are offering here today. Interesting to note Vassarette lingerie is still being manufactured today as a division of the desirable lingerie brand Vanity Fair.